Founder of the International Diploma in Crochet, Pauline Turner, has commented in a newsletter how some of her students are reluctant to experiment with the hairpin method. It is one of the niche techniques which students of IDC Part One are required to learn, along with broomstick lace and Tunisian crochet. Beyond the basic swatches we have to hand in, we must include two of the above techniques in projects for assessment. Unfortunately, a couple of patterns I liked based on hairpin were above my current abilities. So I went back to my approved samples and, with a bit of imagination, developed a simple garment. 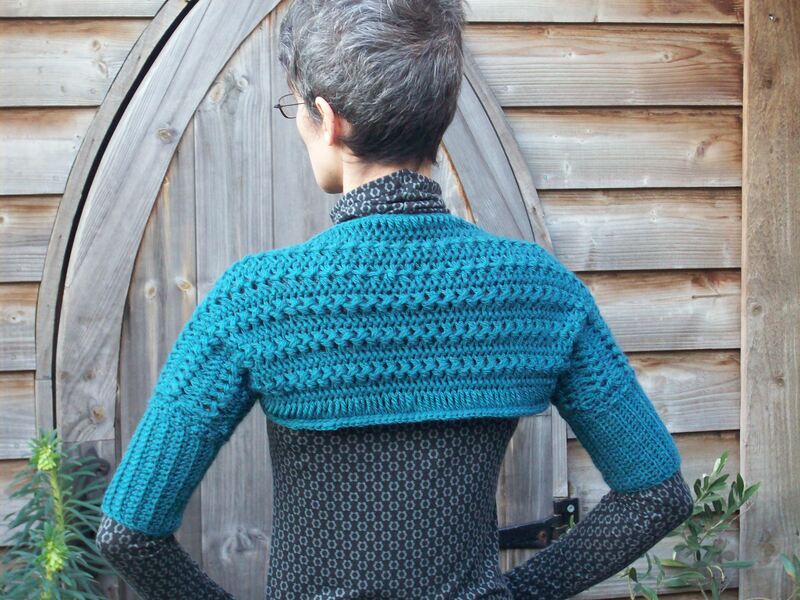 It’s a shrug based on a rectangle, with no shaping needed. Ribbed sleeves were added using a technique I learned from the hat (which I still have to re-work) mentioned in A Christmas Carol.. of Sorts. i.e. adding dc ribbing to the garment sideways, attaching consecutive pairs of rows to the main body of work with slip stitch. I was also thinking about adding a trim along the upper edge to make a collar but… “less is more”, as a friend says. We’ll see if my tutor agrees! Another hairpin item I have come up with is a long pair of mitts; keen-eyed readers may have spotted these in the post Mitts for Monday. These again combine hairpin with ribbing, but the rib is worked along an edge of the hairpin as normal crochet so that it runs vertically when worn, not horizontally. Overall, I would say that hairpin is a bit of a fiddly technique, but easy to get the hang of, and I think the results are definitely worth it! So, I’ve taken my first tentative steps into the realms of making-to-sell! I had the oppotunity to host a stall at a Christmas party-bazaar last Sunday, run by a Walthamstow-based jewellery maker who I’ve done a few classes with. (Birgit Barrett of Beyond Beading. www.beyondbeading.co.uk ) I committed to the stall around four weeks before, without having any products or specific designs. I settled on the idea of mitts which are, in theory, quick to make up. I only managed nine pairs in the end. It would have been twelve, but I messed up three sets. Frustrating!! Nine pairs in four weeks may not sound like a lot but several factors affected productivity: due to the size of the venue, I knew the stall would be small (between 2 – 4 pages of A4) so I was told I wouldn’t need much; some of the time was spent experimenting (not all ideas worked out – as I had precious little time, this felt like a waste of time rather than a learning process); and I went to visit a friend for a few days. Unnecessay distraction! 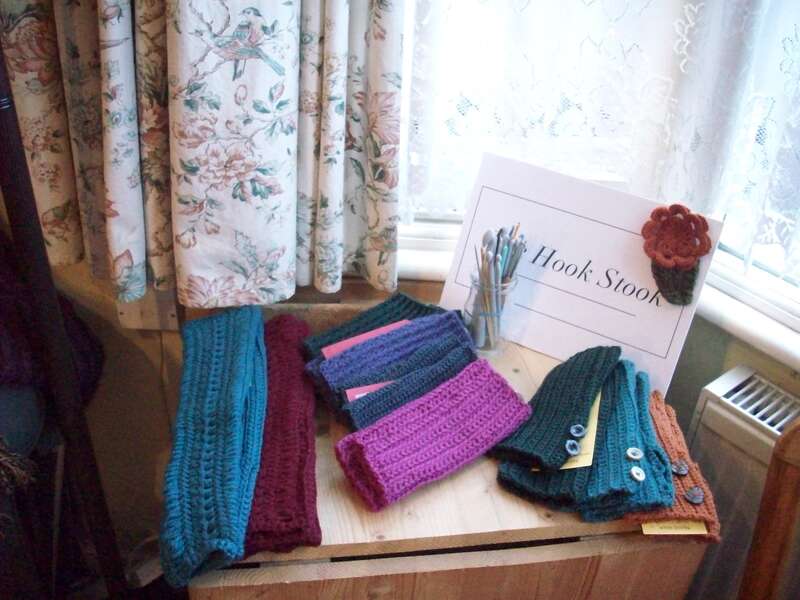 I did four styles: plain rib (double crochet front loop only: half treble back loop only); plain rib with buttons at the wrist; a double ribbed type (a ridge&furrow rib acheived with raised trebles, with the flatter rib of the other mitts across the palm); and longer mitts using hairpin crochet, again using plain rib over the palm. Having beavered away for a month, I only managed to sell one pair! Still, better than nowt! And most other stall holders didn’t sell much either. Birgit said similar events in previous years fared better, but that’s just the way it goes. One of the other stallholders said the amount of times she’s sworn she wouldn’t do another market after a slow session… but she always does. Interestingly, one of the jewellery makers said she can’t make products with beads and stones she doesn’t like. In agreement with her was a lady who makes cards and crocheted brooches. She said she had at one point really focused on what she thought customers might like, choosing a range of colours etc, but that these items didn’t sell well after all, so now she makes what she personally likes. Food for thought for a newbie like myself! It was definitely worth doing this small event. I had positive feedback on my products and the experience got me thinking about presentation (not my forte). Luckily, my fabulous friend Lesley and her lodger Serena had been on hand to help out doing labels etc, for which I am very grateful. I owe them a cake or a round of drinks..